SODELPA continues to lead the official results of the 2018 General Election with 48,120 votes from 573 counting centres which have officially been counted and processed. The party managed to secure 33,551 votes from the Central division followed by 6,160 votes from the Eastern divison, 4,007 from the western and 4,402 from the North. 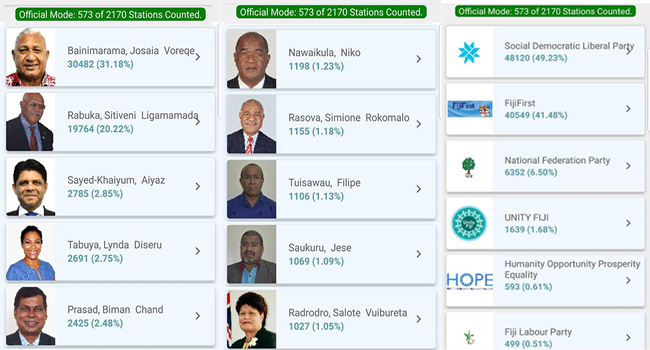 FijiFirst trails with 40,549 votes with 33,248 votes secured from the Central division, 3,224 in the west, 1,923 in the North and 2,154 votes from the East. The National Federation Party is in third place with 6,352 votes, followed by Unity Fiji with 1,639 votes, HOPE with 593 and Fiji Labour Party managing to secure only 499 votes. However, FijiFirst leader, Voreqe Bainimarama continues to top the candidate list with most votes securing a total of 30,482 votes. He managed to rake in 25,586 votes in the central, 1921 in the west, 1439 in the North and 1,536 votes in the Eastern division. SODELPA Party Leader Sitiveni Rabuka follows with 19,764 votes. FijiFirst Candidate Aiyaz Sayed-Khaiyum has moved to third spot with 2,785 votes while SODELPA Candidate Lynda Tabua secured 2691votes. The results will continue to be officially released by the Fijian Elections Office as the day progresses.